For a while I have been trying to find the perfect nappy clutch. It has been difficult to find a way to carry nappy's, nappy bags, wipes and a toy for Maxwell without having a bag the size of a overnight holdall. Recently I was sent a beautiful handmade nappy clutch to review from The Sprog Shop. The nappy clutch we were sent was a Handmade Nappy Clutch by Ildi. The beautiful handmade nappy clutch is the perfect size for two nappies, a packet of wipes, nappy cream and some nappy bags, I also managed to fit a small toy in it for Maxwell. It fits into my bag for quick trips out and about or easily fits into my handbag/changing bag for longer trips away from home. Its perfect to use for a quick nappy change in the restroom, instead of lugging a bag with you and taking all your own personal items in which can cause havoc. 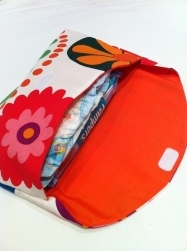 The Nappy Clutch is sturdy, strong and carefully put together with precise stitching. One of the major bonuses of these clutch bags is that they are easy to wash, which means milk, baby food, juice or worse baby blowouts will never leave stickiness or smelliness in your nappy clutch. There are 3 lovely handmade nappy clutches you are able to choose from. I was sent the flower style of fabric for mine. I love it, it is bright and very girly as well as fashionable however if Ben was going out with Maxwell then I think the Double Bubble nappy clutch would be perfect for him as this would fit perfectly in his man bag and again would suit his manly style. These nappy clutches are at a bargain price of £7.50. I personally think not only is this clutch perfect for Mummy's to buy for themselves as a treat but also suitable for a gift for any expecting parent! You are also able to visit there amazing website.